Sara Niemietz and Snuffy Walden on 'House Blend.' Photo: (c) Stephen K. Peeples. 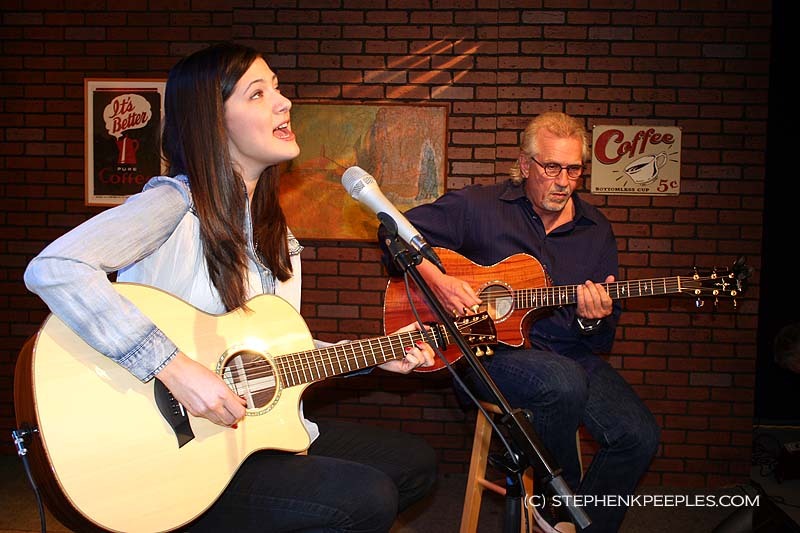 Sara Niemietz and Snuffy Walden on ‘House Blend.’ Photo: (c) Stephen K. Peeples. Return to the Peeples Place at KHTS portal. Santa Clarita-based rock, soul and torch singer, songwriter, guitarist, recording artist and actress Sara Niemietz, along with her mentor, guitarist, songwriter and producer W.G. “Snuffy” Walden,” are the special guests on the next all-new edition of “House Blend,” the WAVE award-nominated music and interview program on SCVTV hosted by veteran music journalist Stephen K. Peeples, debuting Saturday, March 9 at 10 p.m. Pacific Time. Watch it now: Part 1 and Part 2. Niemietz (pictured at left), 20, a former band-member on the “Glee” TV series, among other credits going back to a Broadway debut as a pre-teen, and Walden (pictured at right), a 12-time Emmy nominee for his music for TV and a winner for his main theme to “The West Wing,” perform three songs for the first time on television, and introduce a popular video from Niemietz’s most recent EP, “Push Play,” out in summer 2012. The songs the duo perform are “Rooftops” (from “Push Play,” with Niemietz also on guitar), “Hey Mister” (new and not yet unrecorded or released)” and “World of My Own” (a new single not on “Push Play”). Niemietz also presents the video for “Go to Bed,” a track from the EP. Between songs, Peeples talks with Niemietz and Walden for a few minutes about how the two artists met and began collaborating, how some of Sara’s YouTube videos have earned hundreds of thousands of views (prompting an appearance on “Ellen”), the writing and recording “Push Play,” their frequent gigs as members of the all-star Babylon Social Club, her recent collaborations with Richard Marx and B.J. Thomas, and what she’d like to accomplish in the future. It’s Niemietz’s second “House Blend” appearance accompanied by Walden; in July 2011 they premiered two songs from the not-yet recorded “Push Play.” Viewer response prompted producers to invite the duo back for an encore performance, and a full show featuring four songs. For more info about Sara, visit her website or her YouTube channel. Info about Snuffy Walden can be found here. Niemietz gets cross-eyed trying to balance a new purse in the shape of a chicken on her head, as she recounts how she found the purse in Nashville and had to have it. “House Blend” is booked, researched, written and hosted by Peeples, who co-produces the series at the SCVTV Media Center in Newhall, Calif., with SCVTV studio director Megan Perez. She also directs the show, assisted by SCVTV’s Austin Dave and the studio staff. Leon Worden, SCVTV president/CEO, is the series’ executive producer. Now in its third season, “House Blend” premiered on SCVTV in September 2010 and airs Saturdays at 10 p.m. Pacific Time, with an encore Thursdays at the same time. The series is seen on Time Warner Cable Channel 20 in the Santa Clarita Valley, and AT&T U-Verse Channel 99 throughout Los Angeles and Orange counties. The program also streams live everywhere via the Web at scvtv.com at the same times. In addition, all “House Blend” programs produced to date — 30 original editions with music and interviews and a dozen all-music best-of compilations — are archived and viewable on demand; click here. Another series highlight is the May 2011 “House Blend” program featuring folk-country-bluegrass legends Chris Hillman and Herb Pedersen, one of three finalists for a WAVE award from the Western Alliance for Community Media. Read more here.